The interactive and visual product configurator for heavy machinery equipment manufacturers. Powertrak CPQ helps construction, farm, and other heavy equipment companies automate the configure, price and quote process with visual and interactive technology. Place it on your website for customers to confidently design and order your make-to-order machinery. Visualize the design. Visually showcase various machinery such as lifts, excavation, mining, roads, and more in near-photo realistic 3D models or 2D drawings. See how each product and accessory moves, rotates, lifts and pulls. Make designing easy. Prevent users from ordering product combinations that cannot be built. Visual configurations simplify the complexity of adding the appropriate accessories, such as blades, cranes, buckets, beds to the machinery. Powertrak guides users to select the best compatible add-on product and shows how it fits together and moves. Make ordering convenient. Drive customers to your website and empower them to design and order on their time. Powertrak ensures accurate bundling, pricing, and product combinations for sales, dealers, and customers to configure, price and quote your machinery - in real-time. 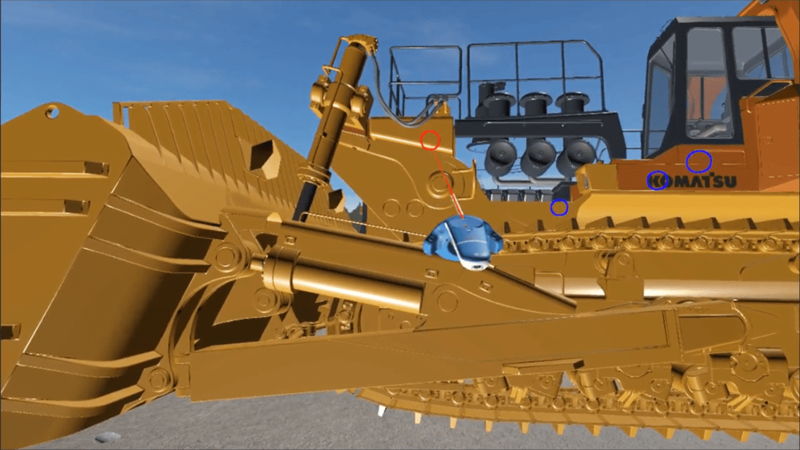 Powertrak 3D Product Configurator software helps tractor and construction equipment manufacturers visually communicate and showcase the competitive differences of their configurable machinery in a realistic and engaging manner. Empower Your Sales Team, Customers, and Dealers to Configure Your Products! Select the type of undercarriage kit - wheels or track - click or drag it onto the model base. When the configuration is complete, experience the design in virtual reality, powered by Powertrak VRoom.